Mahashivratri Recipes, Mahashivratri Vrat Recipes, Shivratri recipes. Maha Shivaratri is a Hindu festival celebrated annually in honour of Lord Shiva. On this auspicious day, Shiva devotees fast. Devotees are seen chanting " Om Namah Shiva". We have a large collection of Faral recipes for you to enjoy. It is the wedding anniversary of Lord Shankar and Lord Parvati. 5. No green vegetables allowed like bhindi, french beans, green peas. Mahashivratrti savour recipes collection from idlis, dosas, potato wafers to pakodas to choose from. Kand aloo pakoda is made from faraal friendly foods. Who says a person cannot feast when fasting! faral means "fast" and these farali pattice are designed specifically for those who are fasting. The coating of arrowroat adds a unique dimension to this otherwise common dish. Served with sweetened curds, to complete the mast experience! This delicious Farali Dosa recipe is made from combination of sama and rajgira flour gives rise to a sumptuous dosa that is sure to please your palate on a fasting day. Sour buttermilk is added to the batter to help in fermenting. The fermentation time is just two hours, so you do not even have to plan for this dosa the previous day itself. This faraali version of Potato Wafers is much, much tastier than regular wafers, because it is perked up with rock salt and black pepper. The famous southie snack can be converted into a healthy and delicious faraal snack by making the faraali idli sambar with sanwa millet and the sambhar with boiled vegetable purée. We have some exciting Indian sweets made during Mahashivratrti. Who can resist a ladleful of sheera, even on a fasting day! Well, why not. Here is a lip-smacking Singhada Sheera recipe that is perfectly acceptable on fasting days as well. Roasting the water chestnut flour sufficiently, till it turns golden in colour, is very essential to bring out a rich aroma and do away with the raw smell of the flour. Sweet faraali pancakes recipe are made from sama, buckwheat, coocnut, banana and jaggery. This recipe has a good coconut and banana flavour to it. My favourite sweet is instant rabri recipe on Mahashivratrti night. You can have a glass of chaas or low fat chaas during the fasting day. For a sweet option have sweet punjabi lassi or mango lassi. A sweet drink option is Piyush recipe made from kesar-flavoured shrikhand and buttermilk. Since rice and dal is not allowed during fasting, it becomes tricky on what to have. We have buckwheat khichdi recipe and sabudana khichdi recipe. Sabudana Khichdi is a perfect food for those on a fast or vrat – but generally wiped off by others in the family who are not on a fast also, because it is so irresistibly tasty! It's also well known as a faraal food. On the morning of Mahashivratri, devotees visit Shivalaya ( Shiva's temple) with a pooja thali containing flowers, bilva patra, datura fruit, milk and ghee. They then give a bath to Shiva's pind with ghee and then milk. They then offer ghee Niranjan in the temple. The Mahashivratri fast is broken the next day. During the fast, devotees eat food from the above list mentioned or follow our recipes below. At many temples, bhandara is done where food is prepared in bulk for thousands of devotees which is given free of charge for lunch. This is done on the day after Mahashivratri. 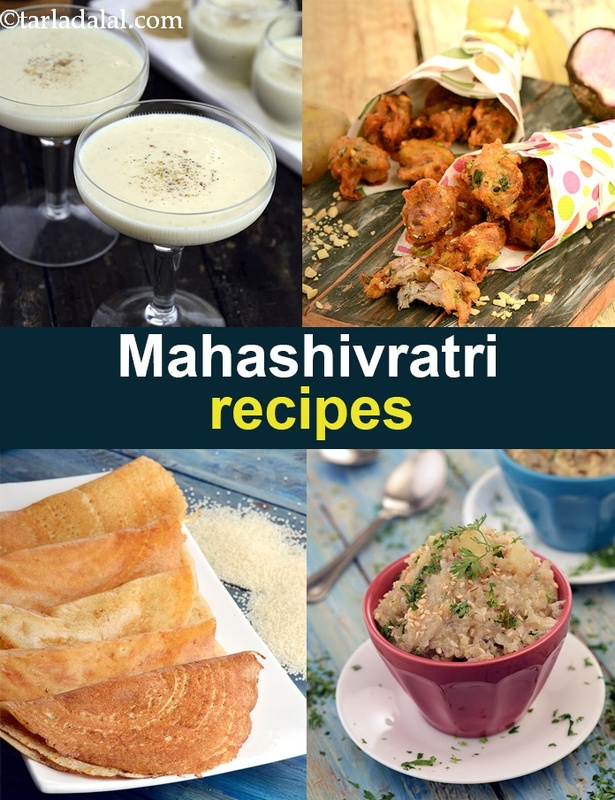 Enjoy our Mahashivratri Recipes, Mahashivratri Vrat Recipes, Shivratri recipes other festival recipes.